Analysts and reporters like to talk about market share statistics, but the conclusions they draw are often misleading. Here's a look at how those numbers are used to paint grossly inaccurate portrayals of the market share of the Zune among iPods, and alternatively the Mac among PCs. Market share simply refers to the portion of a vendor’s unit sales compared to the overall market. However, most large markets include specialized niches that each act as a market. For example, within the overall market for vehicles are passenger cars, and buried within that major segment is the small but profitable luxury car market. BMW doesn't compete against ship and plane builders, nor even the entire line of cars built by GM. It would therefore be absurd to talk about BMW's small share of the "vehicle market," or even to compare its market share among other car makers. It's simply pointless and irrelevant. Why is market share so important in the PC world, particularly for Apple? Microsoft-enamored analysts have long been titillated to report Apple's small Mac market share in comparison to all PCs sold worldwide. They are not as quick to mention that the definition of “the PC market” ballooned as PCs makers pushed into markets unrelated to Apple's business, resulting in a commensurate decrease of Apple's share as the overall PC market rapidly expanded into unrelated directions. By referring to Apple at every opportunity as having "less than a 3% share of the market," it enables them to casually suggest that a $77 billion company with the world's hottest consumer brand is really just of little consequence. Gartner reported in January 2007 that the worldwide PC market in Q4 2006 grew by 7.4% over the previous year to 67.3 million units. Apple sold 1.6 million Macs in that quarter, giving it a mere 2.3% of that global market. 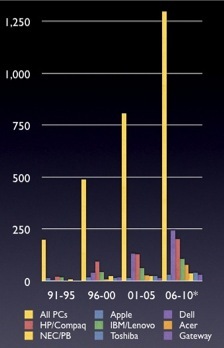 Charting Gartner's sales numbers for PCs since 1991--including its estimated sales through 2010--provides Apple with an embarrassingly tiny bit of blue next to the towering yellow bar representing the entire worldwide PC market, even when the chart is expanded vertically to flatter Apple. However, in the same January 2007 press release, a Gartner analyst also stated that "the PC industry battled for wallet share against other consumer electronics products, such as games consoles and flat panel TVs." In other words, the vast PC market is but part of a larger market: consumer electronics. Additionally, Gartner also breaks out the US market as distinct from the worldwide market. Worldwide, Lenovo, Acer, and Fujitsu place third, fourth and fifth, while in the US market, they don't show up in the top five at all. 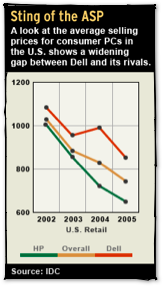 Further, while HP leads worldwide PC sales, it is second to Dell within the US. How is that even possible? Clearly, market share isn't a subject where numbers "speak for themselves." The more contextual information one has, the less relevant a specific portion of the entire world's market share appears to be. Comparing a half to a seventh to a thirty-third is difficult to conceptualize. With everything in hundredths, a portion of the overall pie is easier to fathom. Even with percentages however, it is easy to set up comparisons that are very misleading. A vendor selling 100 units in a year and 200 the next year could be accurately described as having "200% of the previous years sales" or "a 100% increase over last year," or alternatively only having sold "50% as much" the prior year. That variety in phrasing, combined with variations in the definition of a market, can be used to tell remarkable stories that entirely misleading, but which appear to be supported by logical and accurate statistics. When Microsoft announced it would abandon its PlaysForSure partners and take on Apple’s iPod with its own Zune music player, analysts were careful to point out that Microsoft had taken over markets before. Since Apple had sold lots of iPods, it was assumed to be an easy feat, and since Microsoft had outsold the Mac a decade ago, it logically followed that history was about to repeat itself, or so they said. 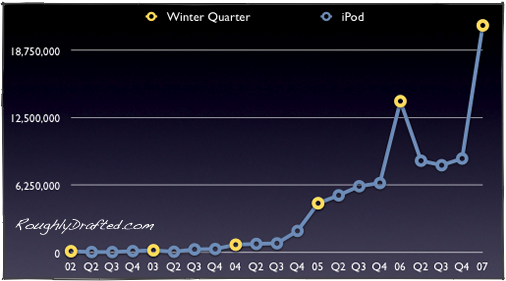 Apple's iPod has experienced phenomenal growth since its 2001 unveiling. Like the Mac, the iPod largely created a new market rather than displacing an existing one. 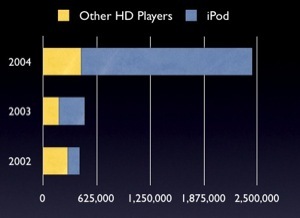 In 2002, Apple had 33% of the hard drive music player market with 4th quarter sales of 140,000 iPods. A year later, it had 64% of that market selling 304,000. Apple more than doubled its sales, while the rest of the market failed to grow at all. A year later, Apple had 82% of the hard drive market with sales of 2 million in its winter quarter, meaning that all its competitors were selling less than a half million units combined, a minor increase over the previous two years. Apple wasn't eating into other players' sales, it was greatly expanding the entire market for hard drive audio players. That was just what Microsoft had done in the computer world the early 90s: it didn't sell Windows to the existing market of Mac users, but rather sold Windows PCs to a broader market around the Mac, replacing dumb terminals and DOS boxes, and putting Windows PCs on desks that had never had a computer before. Microsoft didn't replace the Mac; it pioneered new markets outside those Apple was targeting. In doing so, Windows helped impede any major new growth of the Mac platform, but sales of new Macs remained fairly consistent at around 3-4 million per year over the last decade and a half since 1991. If we pull the yellow bar “of all PCs sold” out of the above chart, it demonstrates that Apple continued to sell roughly the same 17 million Macs every five years since 1991. 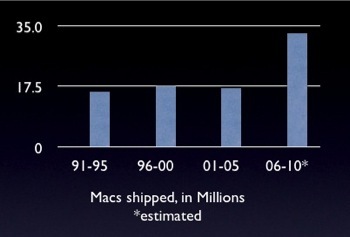 Gartner estimates that Mac sales will roughly double between 2006-2010. While analysts once liked to say that the Zune would take over the music player world in the same manner that Windows PCs engulfed the Mac, the situation was really not even remotely similar. Analysts had things entirely backwards. With the Zune, Microsoft would not be selling a cheaper version to a different audience, but rather introducing a device of the same price to compete against an established brand. Microsoft was attempting to eat into the high end of iPod sales, not roll out a cheaper version of the iPod to cube dwellers who had never heard of music before. However, as predicted in Myth #8 of 10 iPod vs Zune Myths, the only sales Microsoft could easily displace with the Zune were its own partner's PlaysForSure devices. Microsoft gnawed off its own foot, which while technically an achievement, only managed set the company back in its efforts to expand in the overall market and to push the adoption of Windows Media in place of the QuickTime-based iTunes. It will be very difficult for Microsoft to grow that foot back. As for the prey it had intended to eat in its feeding frenzy: the iPod--in the same quarter--grew dramatically larger by extending its appeal to new buyers rather than just resorting to cannibalizing itself for some quick sales. The tables have turned 180 degrees since Copland. Microsoft is now the one trying to bite into an established market but only eating itself up, while Apple's iPod is growing rapidly by broadening its appeal to new customers. How well will Microsoft continue to fare in a market with real competition? “We took, I don’t know, but I think most estimates would say we took about 20-25% of the high end of the market. We weren’t down at some of the lower price points, but for devices $249 and over we took, you know, let’s say about 20% of the market." Actually, the difference between 20% and 25% of the music player market is around four hundred million dollars of revenue. No doubt Ballmer has a lost his grasp of the value of money, but that's still a lot of cash to toss around as a rounding error. Ballmer also took the liberty of inventing his own concept of what the “music player market” is: when talking about Zune market share, the market only includes music players that cost as much as the Zune. 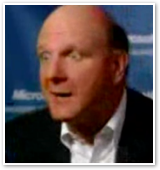 In reality, Ballmer’s reported market share for the Zune was off by an order of magnitude, more than a billion dollars. 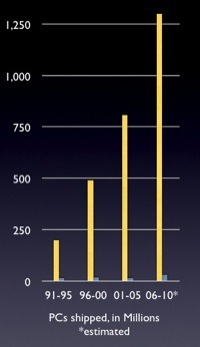 Using Ballmer’s “make it up” market share methodology, what is Apple's market share of PCs costing more than $1000? Dell and HP dump out massive numbers of PCs, and have an average selling price of around $740. If we can simply define our own “market” to fit our own needs, we can come up with whatever percentage we want. 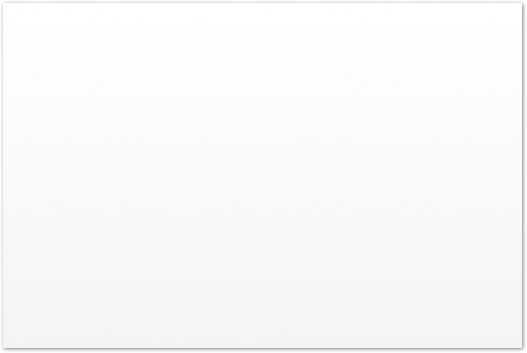 Off the top of my head, I believe Apple's share of the $1100 white Core Duo laptop market is around 90-95%, and I didn't even have look for actual sales numbers. The best sounding news about Zune sales came from NPD. It reported that the Zune had taken 10.2% of the market in December. That would represent a dramatic and impressive first showing, even if it only represented a rush of early adopters. In reality however, NPD's numbers were grossly misleading for a number of reasons. Data Source: First, NPD only reports on subset of retailers, mostly big box stores. That section of the market would represent the majority of Zune sales, because Microsoft lacks major direct sales channels; it has no retail stores, nor does it operate a web store selling lots of Zunes. Apple, on the other hand, has a series of web stores serving education and the general public; a significant retail presence of its own, with over a billion in sales last quarter; and lots of school campus stores selling lots of iPods. Apple also sells a lot of its iPods through other direct channels, including mail order and other web stores. Defined Market: Even more disturbing about NPD's 10.2% was that it was based only on the "market for 30 GB hard drive players." In other words, NPD gerrymandered a Ballmeresque "market" based on the Zune's description, comparing it only against Apple's smaller capacity, full sized iPod model. Users buying a full size iPod are tempted to spend another $100 to get nearly three times the capacity in the 80 GB model. Why cut those buyers out of the "Zune market?" To create an intentionally false story, of course. 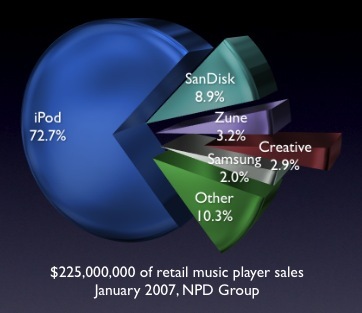 Sales Period: When counting all music players, NPD only reported 2.8% market share for the Zune. But it was still only able to do that by creating a special five week period that added in the Zune's debut week in November with the rest of December. How convenient, because Zune sales imploded after its initial debut week. Once again, NPD’s numbers excluded the Apple Stores' billion in sales, and all of the direct iPod sales, including popular online sources such as Amazon; recall that it was Amazon's popular sales reports that documented the rapid freefall of Zune sales after its debut week. NPD simply pulled out all the stops in trying to define a set of circumstances that would suggest that Zune sales amounted to anything worth mentioning. It even appeared to invent the concept of weekly market share reports, and only abandoned them after it became clear that the tactic wasn’t helping to flatter the Zune. Growth Segment: At the same time, NPD initially reported that Apple's overall share of the entire market for music players had actually increased substantially over the previous year, from 42% to 57%. Again, that excluded all of Apple's retail stores and other direct sales. Obviously, the Zune didn't eat into iPod sales at all, but only cannibalized the sales of its PlaysForSure partners, primarily SanDisk and Creative, the two brightest luminaries of the PlaysForSure universe. Apple's share had continued to grow, even when only considering NPD's subset of numbers from general retailers. The iPod ate up 17 new percentage points of the market pie, compared Microsoft's debut at just 2.8, nibbled out of the share formerly owned by Microsoft's capriciously jilted partners. Later in the month, NPD reported new revised numbers that still gave Zune 2.8% for its magic five month period, but assigned the iPod 72% of the entire market for the overall quarter, rather than the preliminary figure of 57% for that odd five week period that was most flattering for the Zune. Once again, NPD’s numbers only cover retailers that supply it with data, which excludes Apple, Costco, online sales, and mail order outlets.  Based on NPD’s numbers and my math, it would appear Microsoft sold $7.2 million in Zunes in January via retail outlets, which at $250 each would be just short of 29,000 units, making its Dr Evil goal of “one million Zunes!” by June 2007 a bit of a joke. Is There a Better Way to View Markets? Given the near worthlessness of NPD's absurd market definitions and carefully cut out statistics--all based upon an unclear subset of the overall market--is there a more accurate way to look at markets than consulting heavily massaged market share numbers that jump around erratically in a dance that appears to be performed for the benefit of Microsoft? Yes, and it says a lot about both the market for the Zune among iPods and the Mac among PCs. It just isn’t as flattering for Microsoft, so it would only appear on a website supported primarily by reader’s donations. In other words, this site, in the next article.